This website’s RSS feed is misbehaving. If you don’t see images via RSS, please visit the website until this problem is fixed. A man and a woman are seated at a table on which can be seen a covered pot. 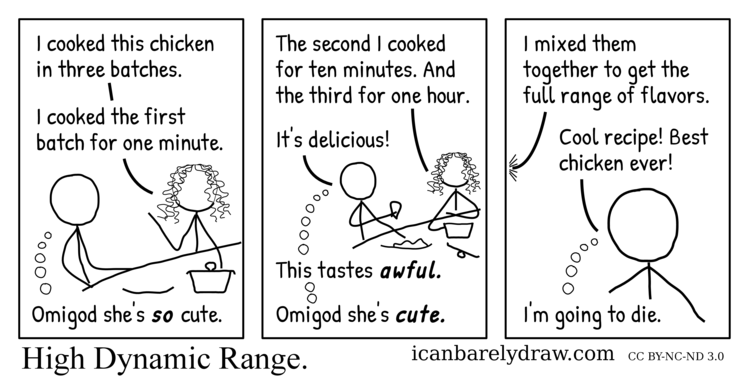 Woman: I cooked this chicken in three batches. Woman: I cooked the first batch for one minute. Man (thinking): Omigod she's so cute. The next panel shows that the lid has been removed from the pot. In front of the man is a dish with something, presumably chicken, on it. The man holds something in his hand, presumably a food item. Woman: The second I cooked for ten minutes. And the third for one hour. Man (thinking): This tastes awful. Man (thinking): Omigod she's cute. The next panel shows the man in a close-up view. Off-panel voice: I mixed them together to get the full range of flavors. Man (speaking): Cool recipe! Best chicken ever! Man (thinking): I'm going to die.